Do you see Blue Screen With Cockroaches? 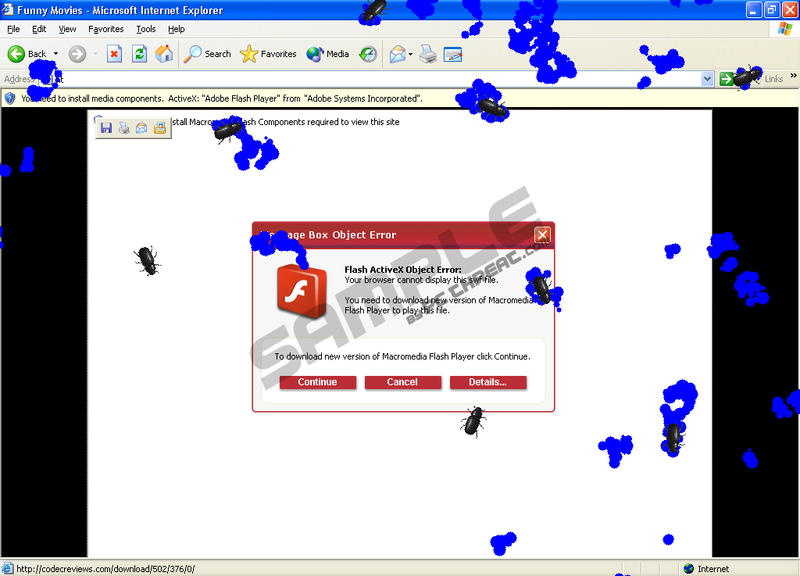 Some users can get this type of infection from installing fake video codec’s (such as Flash Activex Object Error, Video ActiveX Object, Video Activex Object Error) which could help to display video. These codec’s actually install Trojans (like Trojan Zlob) onto a user's computer. In this way, they open a backdoor for all kinds of malware, spyware and even viruses to gain access to the user's PC. For example, after installation, users start to see fake popup warning messages about a computer system infection. These popups usually offer to download Rogue anti-spyware programs like Antivirus 2008, Antivirus2008, VirusHeat, IEAntiVirus, IE AntiVirus, IE AntiVirus 3.2, SpywareIsolator, AntiSpywareMaster, AdvancedXPDefender, AntiMalwareGuard. After some time, the user's screen appears to be full of bugs that are eating the screen. After awhile, the bugs may disappear, but they may appear again if the infection is not properly removed. This is one of the symptoms that a computer is infected. We recommend that you delete this type of infection as soon as possible to safeguard the security of your PC! Quick & tested solution for Bugs on the Screen Virus removal. there is also a ctfmona.exe that could be attached to this. yeah, i like pissed myself when this happened to me, cuz i saw the "fake antivirus"thing and it said that i had like 2000 infections! i also have the virus someone please help! Those damn are eating the warning sign! I don't know much about computer code and stuff. How can i get rid of it? Does it do any harm to the computer other than the annoying bug graphics? Sheesh. I remember when this infected my old computer.